The director of “Dr. Cyclops”, Ernest B. Schoedsack, had a life that rivaled the adventures experienced by many of the characters that populated his motion pictures. At the age of 12, Schoedsack ran away from home. By the age of 17, he was a motion picture cameraman for the legendary comedy producer Mack Sennett. At the tender age of 23, he joined the signal corps as a cinematographer and spent much of World War I in the thick of the most horrendous battles, photographing their every detail. After the armistice was signed, he paired up with another young adventurer (Merian C. Cooper) and the two of them became involved in the anti-Bolshevik movement in Russia, Ukraine and Poland. And this was all before he became the groundbreaking director of some of cinema’s greatest adventures. While it’s not necessary to know the breadth of Schoedsack’s considerable life experience in order to enjoy his motion pictures, there’s something that’s both moving and admirable to know that adventure fantasies such as “King Kong”, “The Four Feathers”, “The Last Days of Pompeii” and “The Most Dangerous Game” came from an imagination that was tempered with having seen and done so much as a young man. Schoedsack’s work is imbued with a sense of wonder, adventure and, most importantly, exploration. What’s especially amazing about Schoedsack’s work on “Dr. Cyclops” is realizing that it was made in 1940. Schoedsack, endowed as he was with a great eye and a knack for special effects was – to put it mildly – one hell of a photographer and filmmaker. His work in this picture laid the visual groundwork (as Kong most certainly did) for generations of films and filmmakers to follow. “Dr. 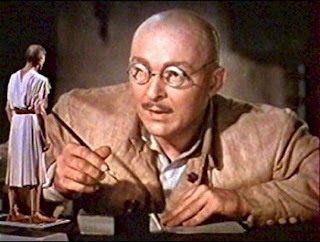 Cyclops” is the fun and thrilling tale of a truly mad scientist (deliciously and brilliantly portrayed by the bald and coke-bottle-lensed Albert Dekker) who uses radium to shrink people and animals alike in a crazed attempt to rule the world. The picture not only features staggeringly gorgeous three-strip Technicolor photography, but a variety of eye-popping special effects that, for their day, would have knocked people on their buttocks and which are, even by today’s standards, quite magical. The heroes and heroines of the piece pale, of course, beside the tragically obsessive central character who is both literally and figuratively blinded – as the title even implies – but this too is par for the course in a sci-fi melodrama on the scale of this one, and while familiar, it fits comfortably like a comfy, old sweater. “Dr. Cyclops” is not the masterpiece that “King Kong” was, but in its own special way, it was definitely ahead of its time in terms of both special effects and political/historical considerations and it amply provides solid entertainment to anyone who loves genre pictures. The picture’s exploration of a “foreign” enemy wanting to experiment upon and ultimately subjugate American interests also pre-dates that attitudes so prevalent over one decade later during the sci-fi pictures made during the Cold War. “Dr. Cyclops” is a most welcome addition to the second volume of Universal’s magnificent DVD box-set entitled The Classic Sci-Fi Ultimate Collection. It’s a gorgeous transfer of a fine little picture and while it’s certainly worth renting, the price point on this box is so reasonable that fans would be well advised to just buy it.